Reprinted with permission from Andrews McMeel Syndication. President Donald J. Trump is right about this much: The vital democratic process of voting has been overwhelmed by fraud, beset by scams, hobbled by duplicity. But the president is quite wrong about the origin of the misdeeds. The chicanery that has corrupted the ballot cannot be traced to undocumented immigrants who show up to vote illegally or elderly black people who cannot produce birth certificates. Actually, the integrity of the franchise is threatened by Trump himself, with ample help from his allies — here and abroad. In his latest attack on the ballot, Trump has appointed a so-called Presidential Advisory Commission on Election Integrity, mostly a claque of Trump cheerleaders whose job is to pretend that massive voter fraud prevented Trump from winning the popular vote. Inevitably, that lie will lead to recommendations that will lop thousands of Democratic-leaning voters off the rolls. Such tactics have been employed by Republicans for decades. Still, Trump is unlikely to be deterred. A narcissist with the most fragile of egos, the president is haunted by the fact that his Democratic rival, Hillary Clinton, won nearly 3 million more votes than he did. He has responded to that fact of basic mathematics with an outsized bit of mendacity: the claim that those votes were cast illegally. Trump probably appointed the commission only because his antagonists kept asking him when he would start an investigation into the massive voter fraud that he has complained about since the election ended. But his minions see the ruse as a means to an end: They can use it to recommend still more rules and regulations — restricted forms of identification, no restoration of voting rights for felons — that will make it more difficult for certain blocs of voters to cast ballots. To make sure the commission heads in the direction he wants, Trump has appointed old hands at voter suppression. There’s the notorious Hans von Spakovsky, who has been at this game for years. As a Republican official in Georgia in the late 1990s, he was an early champion of the voter ID laws that have disproportionately affected poor and black voters. He took that experience to the Justice Department under George W. Bush, where he raised voter suppression to an art form. Trump’s “voter integrity” commission is headed by Kansas Secretary of State Kris Kobach, who is also infamous for his efforts to block the ballot from groups who were historically disenfranchised. He has already been challenged and defeated in court multiple times for his shameful tactics. Here’s what you are unlikely to see from Trump’s commission: any effort to stop the sort of interference that Russia used to great advantage in 2016. According to The Washington Post, which has sources among national intelligence officials, Russian strongman Vladimir Putin ordered his minions to hack Democratic and Republican campaign computers to help Trump get elected. They also tried to hack voting machines, the Post has reported. If Trump were genuinely concerned about protecting one of the most sacred rights of our democracy, he’d see to it that states get the money they need to upgrade voting machines with top-notch security software. But that’s unlikely to happen. Instead, his “voter integrity” commission will probably focus on protecting Trump from this truth: Most Americans did not vote for him. Hmmm. Mine is not a common name in America (although in the Southern Italian village where my family is from my last name is shared by about 20% of the population and my first name – Italian version – is about 15% of that) but there are at least three people that I know of in Connecticut with the exact same name as me. And in the Capitol District region of New York, there are at least 7 (four of whom are relatives). I would hate to see what happens if any of us gets “removed”, especially in Connecticut where photo ID is required to register and to vote! The “N” word, narcissism, should have an update in the dictionary, with reference to Donald along with a sketch of Donald next to the word and definition. Aaron, as we’ve discussed before, it’s a bit sad that even many of the major religious denominations seem to ignore the aspect that in order to be leaders they must be servants to others; and therefore, not weak in that regard, but instead strong in their belief that they’re abiding by what Jesus said was the commandment that sums up all commandments: that beyond loving God above all we must love our neighbor as ourselves, and that we should think more highly of others than we even think of ourselves. In other words, to be true Christians, we should be living as if we are servants to the needs of others; not constantly seeking worldly things for ourselves as the majority do. feet, and to wipe them with the towel wherewith he was girded. There must be a better way to handle elections, but Trump’s self-serving commission will never find it. Instead of trying to create a voters registration to serve King Trump, they could look to voting practices in other countries, where elections sometimes take months, voters indicate they have voted by dipping their fingers in dye, and voters don’t have to leave work on a Tuesday to cast their ballots: elections take place on Sunday! Instead, this commission hasn’t even followed the law governing agencies that seek public records. It has lied about its goal to begin with, and proceeds as if the states and counties nationwide have no idea what is going on. One might be frightened of their goal of obstructing the ability of voters to register and make it to the polls if these idiots were not so incompetent and obviously malicious. Personally, I hope this commission has the opposite effect Trump and his cronies hope for: Lazy Democrats and Americans not yet registered pick up the gauntlet and vote them out of office. The sooner the better. Let’s see, Trump and the GOP are looking to trying somehow to pin voter fraud on Democrats when the Bush Administrations spent years and over 15 million dollars trying to do just that and failed miserably. 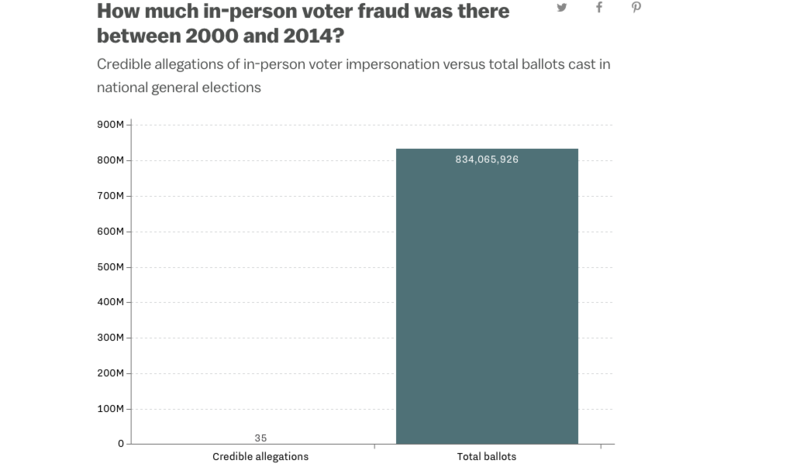 I’m attaching a graph which shows that the Bush Administration’s efforts helped fuel research that covered the years 2000 through 2014 with over 834 million votes analyzed and the research came up with 35 actual cases where voter fraud could be proven. 35 cases of voter fraud out of more than 834 million votes cast. Clear evidence that trying to clean up voter fraud is just like virtually everyone seems to know except Trump and a bunch of his like minded idiots in the GOP – A TOTAL WAST OF TIME AND MONEY!! Having said that, there is something to be done about ELECTIONS FRAUD AND RIGGING. But when we get to elections fraud and rigging, virtually all of it has been done by the GOP – not only voter suppression through all kinds of gimmicks to disenfranchise the poor and minorities; but also outright attempts by the GOP to scam voters by stealing votes.